Jeep looks great. 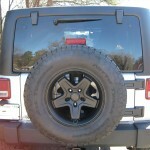 Love the AEV Wheels. Would love to see this baby in all silver (painted top and bumpers). Great work Rock Your 4×4! I agree Jason. I love the all silver look, reminds me of a G wagon.